It is important that all residents show united resistance to the massive apartment complex planned for 750 Walnut Ave., Cranford, NJ! Lawn signs are now available for $10. Email CraoCranford@gmail.com for details and pickup locations. We are an informal network of Cranford residents concerned about high-density overdevelopment in New Jersey. 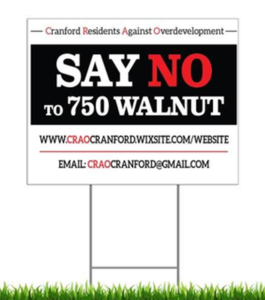 The network’s purpose is to provide up-to-date information about current and proposed Cranford development projects, like 750 Walnut Ave, and to connect people who wish to participate in efforts to oppose threats of over-development. To stay informed on this issue, please Signup for our eNewsletter below. The most recent project is Hartz Mountain Industries proposed 905 mostly luxury rental unit complex at 750 Walnut Avenue. This will increase Cranford’s population by up to 10%, severely straining our school system, emergency services, and traffic patterns in and around Cranford. Agendas for all public meetings must be posted at least 48 hours before the meeting. This is required by the Open Public Meetings Act.